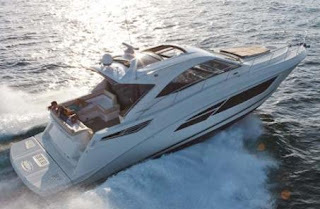 Sea Ray made its 2012 year a very important one from the new model perspective, presenting a total of six novelties. Most important all these new models represented a new step for Sea Ray from the entry level 21 Jet, to the European layout mid size sport cruiser 350 Sundancer, or the invisible outboard 370 Venture. This new 510 Sundancer is the flagship of the new models presented but also of its Sport Yachts line featuring five models and starting with the 410 Sundancer. Filled with a European personality this new Sea Ray records the largest view windows serving the lower accommodation plan from the US builder. It also offers a full coupe experience to speak in Automotive language thanks to a fully enclosed main deck pilot house with sunroof plus patio door fully protecting or opening the area. The 510 Sundancer also offers diversity in the options department being available with ZF Zeus pods instead of the standard line shafts and also as a three cabins version. In the standard two cabins plan the 510 Sundancer lower deck features a full beam midships owners room, VIP suite to fore, and an L-shaped saloon with galley opposite. The interior of the main deck offers a C-shaped settee to port with an entertainment unit opposite, and a swiveling twin helmsman seat which can become part of the area when you are at anchor, this being an unusual in a fifteen meter sport yacht. Engines are standard twin Cummins 550 or optional 600hp.